Our Goal. Properly using computers and other technology can help people accomplish more with less time, less money, and less effort. That’s our goal — helping you do more with less time, money, and effort. Systems Supported. We support Apple, Ubuntu Linux, and all versions of Windows. We also provide Second Life support through a virtual 3D online Avatar in that world. Remote Support and Training. We provide remote online support and training for a variety of topics using email, phone, Skype, and/or TeamViewer. More details are available on our Remote Support information page. Contact us to schedule an appointment. An Ideal World. In an ideal world, computer training and support would be available for free on the web using open copyright training materials. Rather than competing, consultants and support professionals would cooperate and support one another to provide an even higher level of quality support to clients. Welcome to an ideal world… Welcome to The Technology Services Resource Group. Please use the links above to learn more. New Technology. We specialize in supporting the latest technology including devices such as the Apple iPad. Earth Friendly Technology Support. Much of our on-site support is provided by means of bicycle transportation. Our in-house business administration and computing is done using ultra-low power devices such as the iPhone, iPad, and notebook computers. Whenever possible, we provide remote support to reduce our carbon footprint. Data Recovery. We now offer hard drive data recovery for Iowa City and beyond. 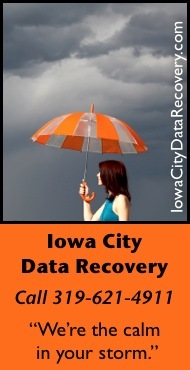 Visit IowaCityDataRecovery.com for more information.